Tulip has a home! - Rocky Mountain Great Dane Rescue, Inc.
Tulip has a home with her foster mom in Arvada, CO!!! 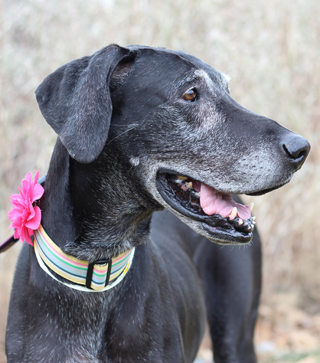 Donna brought Tulip into her home with the intention of adopting this sweet senior gal once Tulip recovered to her fullest potential from her injuries. Tulip was found by good Samaritan with severe lacerations to her front leg and found her way into RMGDRI. It is unknown how she sustained such injuries but Donna has helped Tulip recover a lot of lost range of motion. Miss Tulip has enjoyed trips to the office while Donna works and is enjoying her Dane retirement in a spectacular loving home! !